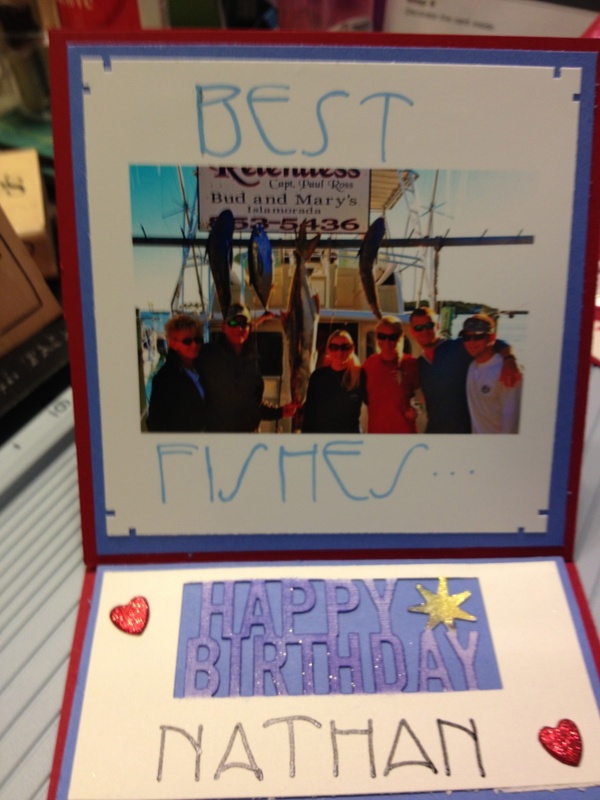 An Easel Card is a great way to show off personal photos and make a card at the same time. It’s not necessary to use a photo , you can easily decorate with stamps or lettering etc. But if you are like me you may have a lot of photos that would make a fun card to send to family or friends. The card becomes an easel when you stand the top fold up and brace it behind the layer you have on the bottom of the inside. To make sure that there is a little space to brace it against I usually put the bottom layer on with double stick foam tape. 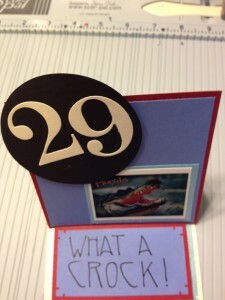 This sample happens to be a birthday card and I also used a large birthday punch by Martha Stewart you can usually find it at Michael’s or Jo Ann’s. Just so you know it fits perfectly on a business card… I also added heart brads in the corner. It is usually available at either Michael’s so wait for those coupons. This is an all purpose card and everyone I have given it to is so delighted that it can stand on their counter or desk. But as you can see it can also be a special occasion card, like Valentines. This was my valentine card from last year. So as you can see there are lots of fun ideas for different purposes for this card. 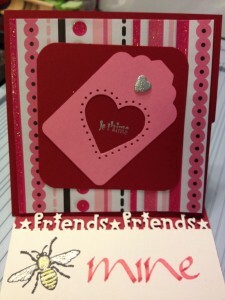 This card pattern is from my favorite card site, its called SplitCoast Stampers. They have a free mailing every Wednesday with a new card pattern, a new fold, a new technique etc. Its great. I don’t always love or want to make what they send but they have complete directions written with color photos which you can print as well a video of how to do it at the bottom of the printed directions. Can it get any better. I like to print them out (In color as its easier to see what you need to do in color) and then because their one fault for me anyway, is that it prints only on the left side of your paper and some directions are 6-7 pages long. You can chooses to print only the actual directions not the way the decorate it which will cut down on some of the pages but I print it out then trim each page down to a narrow column and stick them onto a single sheet usually both front and back of the sheet of paper and put it into a sheet protector and then into a notebook so I can go back and look it up again. I also usually make at least one sample undecorated and stick it in the sheet protector as well so that I have it for reference. Sometimes I just have to touch that fold again to get it right. This one is easy though. As I said its easy to sign up to get their free WEEKLY INKLING and it arrives every Wednesday. I will probably refer them to as SCS. Once you sign up you can also look thru their resources and find all their other TUTORIALS ( that’s what they call them) they are listed alphabetically. I will be putting more of their cards /patterns on my blog as I go along but here is the site that will take you directly to the EASEL CARD. Ok are we having fun yet??? I am and hope you will enjoy this too and keep coming back for more. Next will be a terrific VALENTINE CARD.. either late this weekend or Early next week. PS…thanks to Linda O’Neill, and my mentor Jason Szumanlanski..I figured out how to take you directly to site so if you click or hover over the blue text above it will either take you to the Martha Stewart Punch or to SplitCoast Stampers tutorial for the Easel Card. Also the reason that the Martha Stewart punch doesn’t take you to Michael’s is that they don’t show that one on their web site…but that is where I got mine but in case you aren’t near M or if you can’t find it there I gave you a second spot to go looking for it at Amazon( which by the way is always my “GO TO” spot for things I can’t find or don’t have near by.